Would you like to reinforce your competitive capabilities? Would you like to obtain the best advantages of your local market? Would you like to sign representative agreements and long-term contracts to supply vegetables and fruits at competitive prices and incomparable qualities? Would you like to find a good partner who can push you forward and keep you successful? Historically speaking, Egypt was the food basket for Europe. 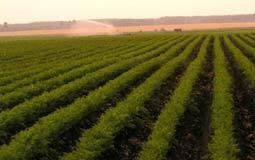 For Egypt as well as the whole territory is bestowed with good climate; cultivable soil; abundance of water for irrigation; and excess of labor. Due to all the above facts, the group has established 'Nada Firm for Import and Export' to offer its products of fresh vegetables and fruits and its services in this concern. The group has secured all the potentialities to attain its goal. It secured farms, sorting terminals, packing and wrapping terminals, agreements with the greatest transport and shipping companies - whether local or international. The group has also appointed two highly qualified agriculture experts. The export administrative, the sales manager and the marketing director are studying the markets that wish to deal with the company as well as the best ways to negotiate with the customers in order to reach the ultimate benefit for both sides. We are seeking a good and serious company within the existing economic blocs; as well as the support of the governments and their consolidations provided for the serious exporters and for the customers.